Located in the heart of downtown San Diego, the Hotel is walking distance from all the main restaurants, nightlife + entertainment! 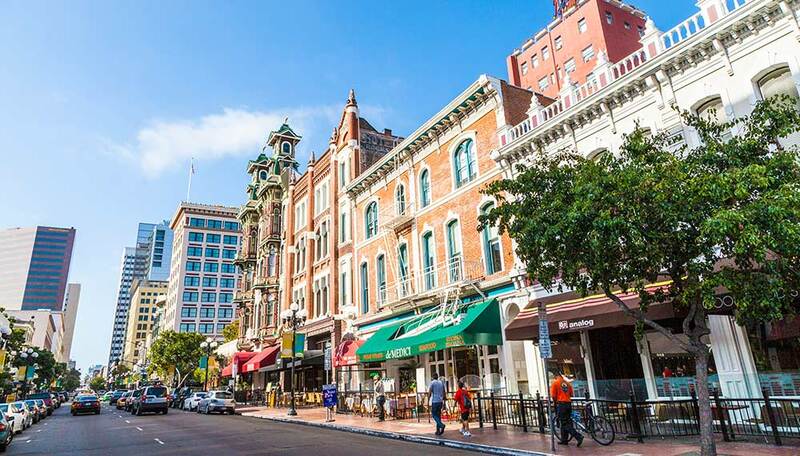 Near by you can find the Historical Gaslamp District + Theaters and the best restaurants in town: Seersucker & Rustic Root. The theme of Kimpton Palomar San Diego is an Urban Chic downtown Boutique Hotel! Not only is the design quirky + unique, but Kimpton also offers ridiculously personal service and unexpected amenities. These include a seasonal rooftop Biergarten, complimentary morning coffee/tea, complimentary nightly hosted wine hour, PUBLIC bikes for rent, and a few other fun surprises along the way! Also, the staff truly wants to make sure your stay is as enjoyable as possible, and they go to far lengths to make that happen. The hotel features a pool, Complimentary wifi, Complimentary Wine Hour from 5-6pm + Coffee/Tea in mornings! Located just 3 miles from the San Diego Airport! "It is different everyday + the amazing people I work with every day! Proposals are always my favorite. You get to set-up a really special surprise for the couple. One time the fiancé booked the Penthouse and had her dog waiting in the room, we put rose petals everywhere! Had her favorite bottle of champagne on ice + music playing. In addition we set up a special table on the balcony with a special chef's dinner or her favorite meal. She said yes- but it was so fun to orchestrate the experience :)"
"They are so happy to be at the hotel at arrival + love the suspense of their weekend." "San Diego is turning into a food city! Make sure to check out our amazing chef driven restaurants. Also the city is Bike friendly- grab a bike and take a spin around the San Diego Bay - so beautiful! My favorite restaurants are in Little Italy and I can't just choose one: IronSide for Seafood, Davanti Enoteca for Italian, and Herb + Wood for trendy everything. Oh and all time favorite wine bar is Carruth Wine Garden!" "Mister A's Restaurant in Bankers Hill - just a mile from the hotel. The rooftop restaurant looks over the city + the planes go right by and you are so close you can almost see inside them. Super cool experience. The restaurant is really fancy so I recommend sitting on the patio and just having drinks and apps off the Happy Hour menu." Have you stayed at the Hotel Palomar? What did you like about your stay? Let us know in the comments!